Follow us on Facebook and Instagram @AnjouVt (#anjouvt) where updates are regular. Stop by to see what we have in stock today. And don't forget to book your event or pop-up gathering @ WareHouse53. To maintain reasonably priced, fun & creative Inventory. To create a well curated atmosphere for your special event or pop-up gathering. Founded in 2009 during an economic recession, Anjou & the Little Pear has been a consistant winner of the Locals Pick Antique and Second Hand Store award for Seven Days Newspaper's annual Daysie Awards. 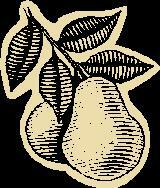 The name stems from the Pear being tasteful and green. We reuse, recycle and procure tasteful items for the home. To join, type your name and email address and send it to AnjouVT@gmail.com Ask to be added to our ever growing list!